When a pet dies, usually you have three choices. You can either allow the vet to take care of the body, take it home to bury in your own chosen location, or have the pet cremated so that you have something to remember it by. 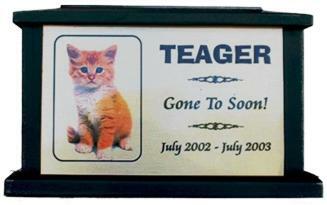 Many people choose the last option because it feels comforting to have something to remember their pet by in their home. Pets are very important to people and they truly become a vital member of the family. When they are gone, their presence and personality is greatly missed. 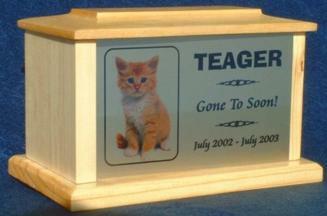 If you have a pet that you are very close to, you may also want to have them cremated when the time comes. Losing a pet is difficult, and maybe you have had your friend with you since he or she was a baby. Perhaps they have been with you through thick and thin and maybe even provided comfort to you at some point in your life. Having your pet’s urn nearby will be a source of comfort to you in the early days after their death and provide you with fond memories in the future. 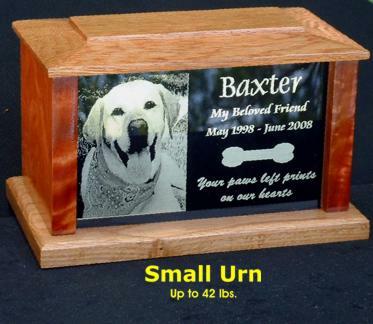 Our pet urns are handmade using exotic woods or simple pine. The exotic woods include eucalyptus, purple heart and walnut. The sides are made from the exotic or hard woods and the top and bottom are made from oak. No stain is used, it is only the natural wood color and a clear finish. 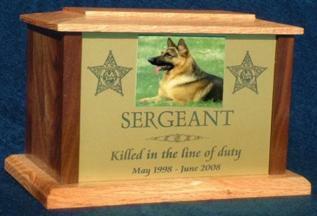 They are engraved to your order, with a photo of your pet and a sentiment. MDF Flat Finish, very economical, finished beautifully with several coats of flat black finish. White pine, very economical, finished beautifully with several clear coats. Black walnut is normally straight grained and is noted for its beautiful grain character, producing more figure variation than any other wood. Over the years the wood develops a lustrous patina. Eucalyptus, has a glowing grain that stands out. It has a reddish tone with streaks of a golden color throughout. Purple heart is an exotic wood from central and south America, and has a deep purple color and a very rich grain. 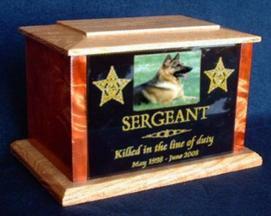 To order Pet Urns please click on the add to cart button and pay for the selection. Use the drop down buttons to choose the size. 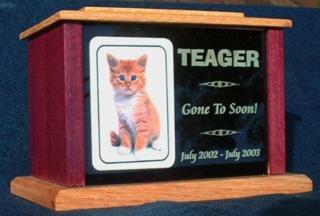 Then email us a photo of your pet that we can put on the front plate of the urn. Then come back to this page and fill out the form below.